One thing is certain, after a single spin of Gather, Darkness!, is that Burning Shadows wears their musical hearts, and influences, on their sleeves. 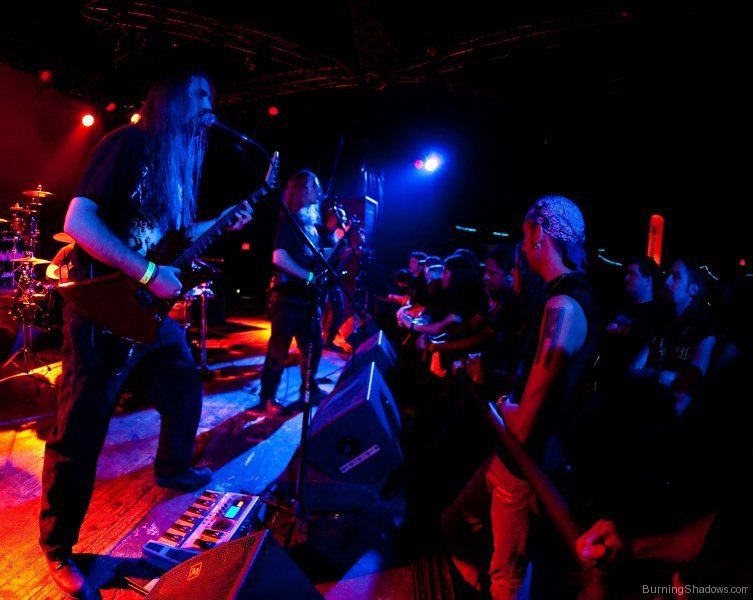 This Maryland band offers classic heavy metal, echoing the giants of Judas Priest, Iron Maiden, and Blind Guardian, and develop it with aplomb. Burning Shadows: burning up the stage. Gather, Darkness! is their second release, and a concept album based upon the short story of the same name by Fritz Leiber, a pioneer in early sword and sorcery fantasy literature (alongside Robert E. Howard and Michael Moorcock). The tale is cast in Burning Shadows vision of epic traditional metal in four parts. The pattern is a steady rhythm section which drives an abundance of stylish guitar solos and Tom Davy's vocals, which see-saw between bright and deeply foreboding. I'll admit after the positive aura of the overture, Hymn to Santanas, Gather, Darkness! did not quite grip me. But once arriving at the longer Onward, things became increasingly interesting, and entertaining, from here to the end. 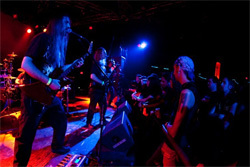 That song set the benchmark for some rather inspired melodic power metal of Kingdoms Fall, the solemn Abandonment, and the crushing conclusion of The Infamous Dawn. Returning to the beginning for another spin, it all fits. 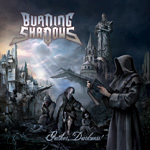 For classic American heavy/power metal with obvious European accents, Burning Shadows is right on target, and Gather, Darkness! is fine and entertaining material. Strongly recommended. For classic American melodic heavy/power metal with obvious European accents, Burning Shadows is right on target, and Gather, Darkness! is fine and entertaining material.